Netizens are lovin’ it! McDonald’s Malaysia has once again shown its creativity, jumping on the hype surrounding the new Avengers: Infinity War movie to promote its six-piece chicken McNuggets. “Enjoy 6pc Chicken McNuggets today at your favourite McDonald’s! P.s. We promise the big purple dude won’t be there,” it added. The Facebook post was in reference to the hullabaloo surrounding the race to stop Thanos – the purple dude in this case – from collecting all six infinity stones in the movie. In a statement to A+M, marketing director Eugene Lee credited Leo Burnett Malaysia for being the brains behind the viral post, adding that McDonald’s Malaysia is “very open” to such creative posts. He is also constantly encouraging its agency team members and even the marketing team at McDonald’s to think differently. Customers will forget what you tell them, but they will never forget how you made them feel. As such, it does not matter if it is a Facebook post or TV commercial, Lee said his goal at every single consumer touch-point is to make them feel something. This post surely struck a chord with consumers for Lee said that McDonald’s witnessed a spike in nuggets sales after it was published. Senior art director Jeff Ho and senior copywriter Jay Loh told A+M that they saw an opportunity to engage with consumers through something “fun and current” and they took the plunge. 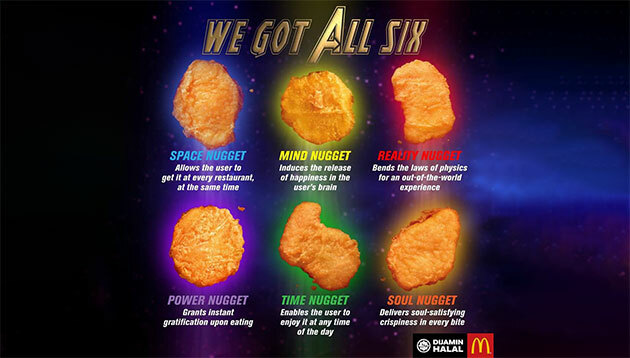 “Six Infinity Stones, six pieces of chicken McNuggets, it just clicked. Thankfully, our clients are great partners and very supportive of both big impactful ideas as well as simple small ones,” they added. Which McNugget would you choose? Global CMO Jochen Sengpiehl revealed plans about the brand’s long term vision, which includes an agency model organised by region,..
Plans are also underway to look into the reward programmes of both partners and explore ways in which customers and subscribers of..
Is this a move more publishers should think about?.. The Cartoon Network Move it Movement – presented by AIA Vitality will include games of both mental and physical skill, on-the spot..
Konew Financial Express’ (康業信貸快遞) latest branding effort has seen a turnaround in style with a six-minute TV commercial starring h..